Mature Height 4 - 6 ft. Mature Width 4 - 6 ft.
Dark-foliage plants are always a winner in the garden, bringing interest and color all season. The Bonfire Peach Tree has large, spear-shaped red-purple leaves that hold their brilliance throughout the summer, but wait, there is more. Each spring, before the leaves appear, this charming shrub is garlanded with rich pink flowers. Their floral beauty is enhanced with elegant red veining, making a winning effect in your garden or as a long-term container plant on your patio or deck. A mid-sized shrub that grows up to six feet high, the Bonfire Peach Tree will bring a splash of color to your garden in all seasons. 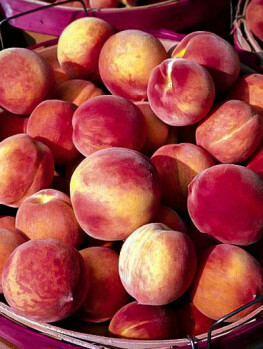 It also produces a crop of small peaches suitable for baking and which also looks charming hanging from your tree. 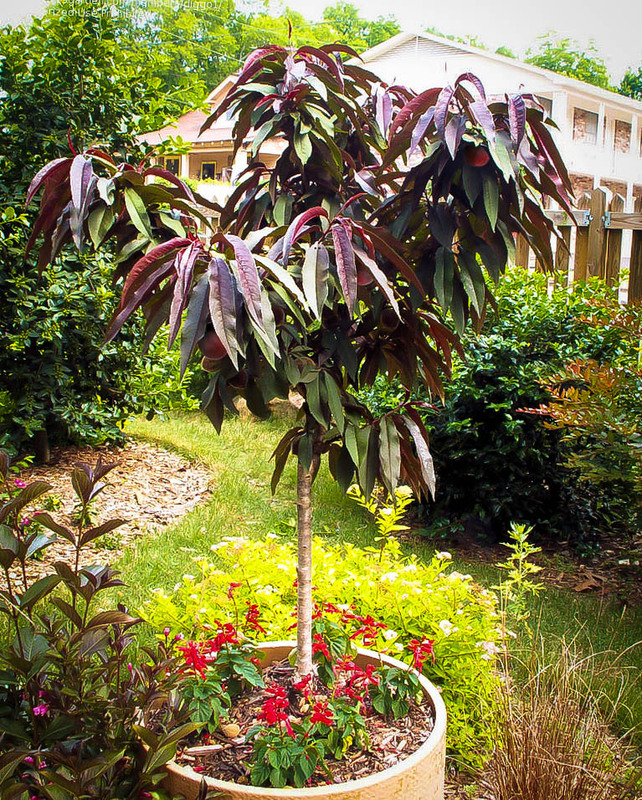 Dwarf trees are a favorite among gardeners who want to enjoy the looks of a flowering tree in a small space, but the fact is they can enhance and enrich any size of property. Full sized trees can be attractively accented by surrounding them with dwarf varieties that offer contrasting foliage, or that form an intermediate step between the trees and your smaller plants. Flowering trees are particularly popular as dwarf varieties and the spectacularly colored peach known as Bonfire is one of the finest examples you’ll find. 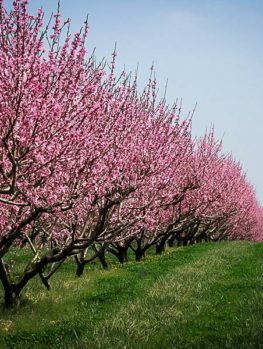 Peach trees, the species Prunus persica, originate from northwest China, where they’re believed to have been cultivated for their fruit for at least 4,000 years. 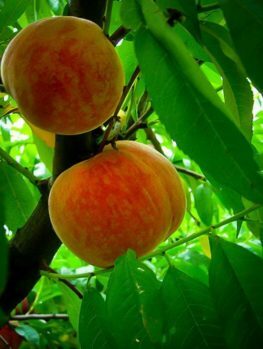 By the time of the ancient Romans they had spread to the Mediterranean coast and in the 17th century peach trees were brought to the American colonies. 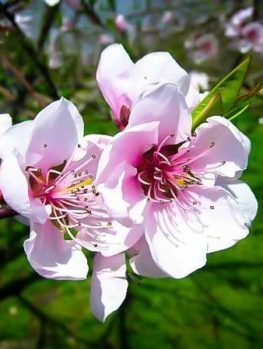 Since early in their cultivation history some varieties have been bred for their appearance rather than their fruit; all peach trees flower, but on the fruit-producing varieties, the flowers are less showy and are usually thinned out to encourage better fruit. Ornamental cultivars, though, are bred for larger, more numerous flowers – and this characteristic carries over to the dwarf varieties. Bonfire is a medium-sized shrub form of the peach tree. It grows to between four and six feet high, usually reaching its full size in five to six years. It takes a mounded form and is usually about as wide as it is high, although occasionally it can spread further. In spring it grows a dense cover of deep red foliage, which will hold its color all the way through to fall. 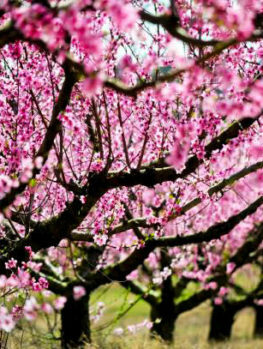 It’s at its showiest in April, though, when it produces a dense crop of vivid flowers. These can vary in color from a pale pink through to an almost red shade. The flowers themselves are quite small and cup-shaped, with a double row of petals; they grow in clusters along the length of the branches. 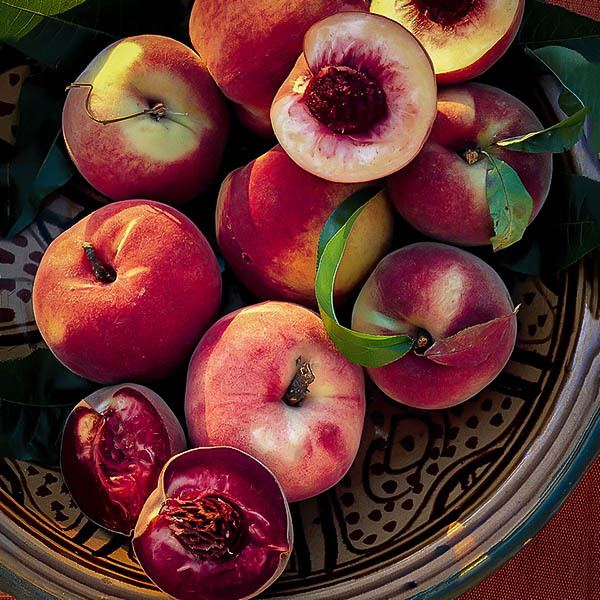 The flowers fade by early summer and are replaced by fruits which resemble normal peaches, but are inedible. The fruit is usually inconspicuous, though, as the foliage is dense enough to hide it. 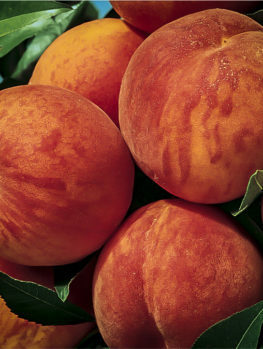 This variety is quite robust for a peach, and can be successfully grown in USDA plant hardiness zones 5 through 8. That makes it suitable for most of the continental United States apart from northern regions where winters are too harsh, or the drier parts of the South. It does prefer winter temperatures to drop to around freezing and the tree itself will tolerate much lower than that, but any lower than 5°F is likely to kill the infant buds. Look for a spot with moist but well drained soil, ideally in full sun; Bonfire can tolerate some partial or dappled shade but the flowers will appear at their best if it gets sunlight all day. 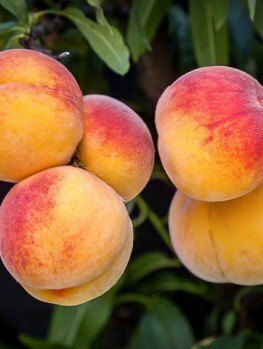 Like most peaches it prefers medium-weight acidic soil; it should do reasonably well in neutral ground but of your soil is alkaline it’s best to modify it with rock sulfur or peat moss before planting. 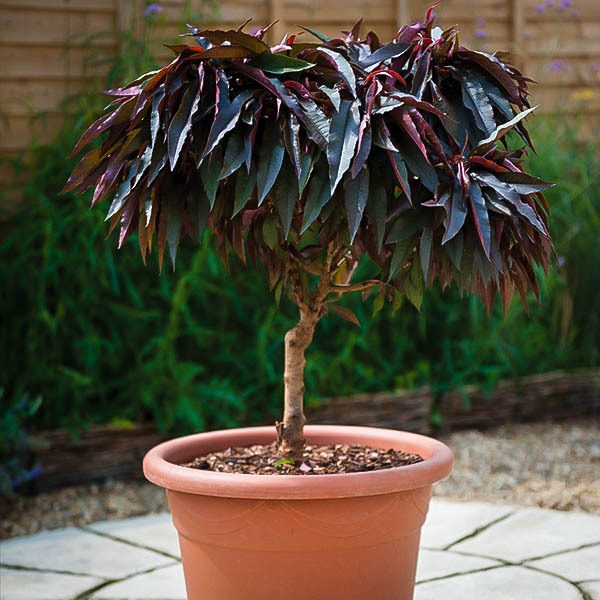 Alternatively it’s small enough that it can be planted in a large container; this is a great option for patios, and also lets you move it to a more sheltered location in winter. Bonfire does need some maintenance. If there’s a dry spell it will need regular watering, but don’t overwater or the leaves may lose their characteristic red color and turn orange or green. 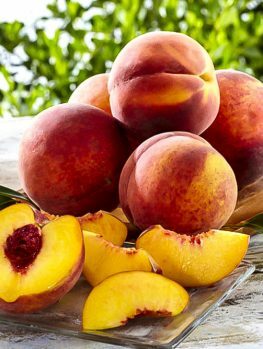 It will also benefit from regular spraying to deter insects; ornamental peaches don’t need as much as fruiting trees, but in most places some insecticide will still be necessary. Like all peach varieties Bonfire is attractive to a wide variety of pests including peach twig borer, spider mites, scale and aphids. It can also suffer from peach leaf curl (especially if it’s exposed to cold winter rain), leaf spots, canker, mildew and root rot. Regular treatment for these conditions is also useful for keeping it in good health. If pruning is necessary it should be done in late fall after the leaves have gone; the buds begin to form early, so pruning in late winter or spring can reduce the flowers. Overall the work involved in maintaining this shrub is a small price to pay for its appearance and versatility. It’s a fantastic choice for surrounding a patio, giving a bold display of colors all through spring and summer then on into fall. Its size also makes it an interesting addition to borders, and it can even be shaped into an extremely attractive hedge with some judicious pruning. This is an attractive and compact plant with a lot to offer, and compares very favorably with most other flowering shrubs of a similar size. We’re sure you won’t regret the decision to plant one or more, especially if you choose high quality young trees from The Tree Center.